How do people know what is truly valuable without the benefit of hindsight? Well – the answer is simple really – people don’t know. And that is merely one of the motivations behind this 60 minute BBC stage show made in 2010, and Starring: Jonathan Ross, Peter Cook, Dudley Moore, Adrian Edmondson, Alistair McGowan, Angus Deayton, and Hugh Dennis. 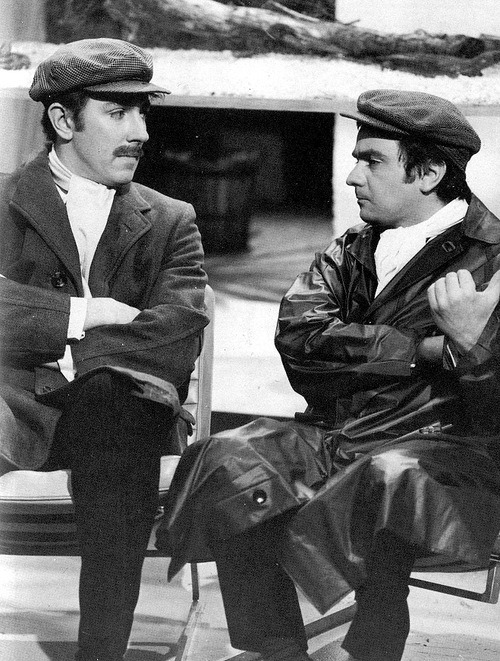 During the 1960’s, after their success with ‘Beyond the Fringe’ both at home and abroad, Peter Cook and Dudley Moore made a highly respected television sketch comedy called ‘Not Only But Also’. Each week, these two comedians would provide satirical and jovial entertainment, which was one-half subversive, and one-half funny. In fact, it was so funny, that the BBC decided to bin most of it. However, within recent years, some of Pete and Duds ‘lost sketches’ have resurfaced once more, thus provoking the formation of this one hour special. Now to help re-enact this mammoth task, host, Jonathan Ross, charters the course of how a select hand full of present-day comedians, will all bring back Pete and Duds work to a live studio audience. These comedians are, Adrian Edmondson, Alistair McGowan, Angus Deayton, Hugh Dennis, Nick Mohammed, Jonny Sweet, and Simon Day. In addition to this, to give some relevant background to these proceedings, stock footage of Pete and Dud’s ‘not lost work’ is provided, plus incites from the likes of David Mitchell, Barry Cryer, and Stephen Fry. THE INTERVIEWS: Poignant and re-collective insights about both Pete and Duds partnership are reminisced and expanded upon, inadvertently laying out the motivations and inspirations behind their collaborations together. The Music Teacher – ‘I understand that the white notes are more louder than the black notes’. The Wardrobe – ‘My mother does not look like a Wardrobe, though those nobs do look familiar’. Isn’t She a Sweetie – the song says it all. Fathers and Sons – ‘It is not a dress-shop father, it is a boutique’. The Headmaster – ‘You must realise headmaster that I am considerably bigger than you are, and I can punch your face in’. The Physiatrist – ‘My wife’s name is Stephanie too’. When I was a kid, I did not like Peter Cook. OK, I have to admit, I did not know why I did not like Peter Cook. I just remember that the first time I saw him upon the television, I immediately though that he was some sort of ‘headmaster’ type – which bothered me a bit. Now I cannot say the same thing about Dudley Moore – no way – because when I first saw him on the box, he seemed like a friendly avuncular figure, with a big bold smile and way about him that just made me laugh. 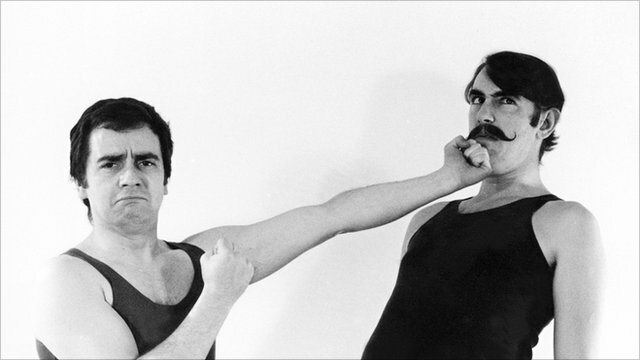 However, over time, and my admiration for British comedy grew, my opinions about both of these men changed quite a lot. 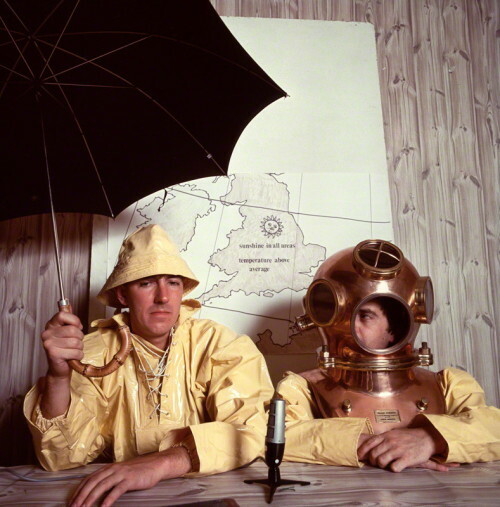 For a start, I could appreciate the creative force that Peter Cook had, within his and Dudley’s double act. Next, I could understand why Dudley seemed to balance out his and Pete’s diametrically opposed physiognomy. And finally, I could digest why Pete and Dud became who they are, as well as why they became pariahs to British comedic legend. OK, was all of that 'comedic back-story' a strange thing for me to charter at such a young age? Well – maybe – given my present benefit of hindsight. Still, after watching this one hour special, it was nice to know that I was not alone with my endeavors, and that like-minded comedy-buffs also found what I though was special in Pete and Dud’s work too. Obviously, like most other comedy critiques, I can be rather coy about this homage to Pete and Dud’s good name, ‘Pete and Dud: The Lost Sketches’. But I won’t. Because how can I denigrate or comment on a comedians performance, where as, in actual fact, I would have loved to have been in their shoes. I can just imagine sitting across from Adrian Edmondson and saying to him ‘I will stand by your bum’s as far as I can’ in a stern and authoritarian voice. Moreover, I can image sitting across from Hugh Dennis and muttering ‘I am in love with your wife’, whilst fidgeting about with my glasses as well. So how can I anything bad about this show, when I would have loved to have be apart of it! Give them their dues – all of the comedians involved (especially Hugh, Adrian, Angus, and Alistair) – you can see that they are all trying to their best, knowing deep down inside them, that they will never be able to mimic or ‘live up to’ peoples expectations. Granted, some of the performers, (namely Nick Mohammed and Jonny Sweet) do not seem to exhume the same type of gravitas that the other comedians around them have. Nevertheless, that is not to say that they did not at least channel the same spirit, or that their performances were any less ‘Pete and Dud’ like in nature (If that is a proper word). I would now like to end this review with a song that I feel tries to share the sentiment that I want to convey about this programme. Good program – nice idea – shame that the BBC are a bunch of c*nts.